What’s up with the departure of Macy’s and Chili’s from Plenti? Add to this AT&T’s departure last fall and you have to wonder what’s going on. Well, while the departure details are scarce, there is one thing all three have stated as a reason: they are switching to their own loyalty programs (Macy’s: Star Rewards, Chili’s: My Chili’s Rewards, AT&T THANKS). This news bring up an interesting question: should loyalty programs designed more for love of brand or love of the deal? Probably both, and the answer is different by customer. We are wired differently as customers, as shoppers. On one side we have people who love their brands, and while they may want a deal, they only want it from their brand(s). On the other side we have people who love the deal, regardless of the brand. The people who love their brand (e.g. 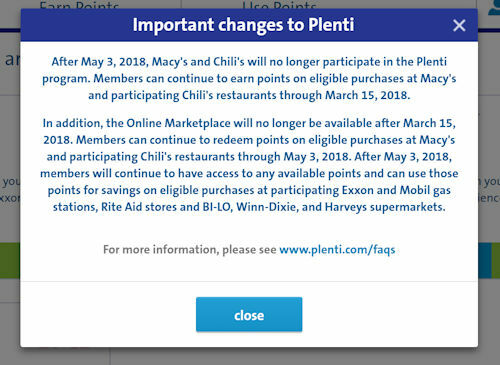 Macy’s, Chili’s) were forced into the Plenti Reward program. To truly take full advantage of Plenti, these customers would have to also change other brands – like switching their pharmacy to Rite Aid or their gas station to Exxon Mobil. Odds are they didn’t switch. This takes effort. Effort they probably weren’t willing to commit because they are comfortable with the brands in their life. These brand citizens just wanted a reward for their brand loyalty, from Macy’s, AT&T or Chili’s, not from Plenti. The deal seeker is a different story. They are brand free agents more than willing to shift retail brands and purchase habits because they spend time to save money. The only caveat is the reward must be worth their time when compared to other retail deals in the marketplace. Many deal seekers are deal savants and know a deal when they see it. If they see a deal within Plenti rewards, they will not hesitate to switch brands to save money. There is a temporal motivation to consider with a deal seeker: do they want the deal now, or are they willing to wait for a future reward? These motivations are not mutually exclusive. Fuel Perks are an example of this. Many grocers, like Kroger, offer fuel perks. Kroger can provide deals on every store trip and also reward their customers will fuel discounts based on the customers accumulated purchases. Plenti is a point system, therefore, the immediate rewards must be offered by the brand. While partner brands like Rite Aid or Winn Dixie can provide immediate deals, a partner like Exxon-Mobil or AT&T do not. This lack of an immediate on-going deal would be a hindrance to attract deal seekers on a regular basis. So, where does Plenti net out in all this? From the brand citizen perspective, Plenti is probably largely ineffective. These people aren’t going to change their habits. At best customers will be neutral about the program. At worst, customers will feel they are not rewarded for their patronage, and may decrease their brand usage. This may be why AT&T, Chili’s and Macy’s switched to their own loyalty programs. However, there may be another reason. More than likely brands signed up with Plenti with the hope (or promise) they would be hijacking other brand’s loyal customers. This would build their customer base and category share. The deal seeker would be the optimum switcher in this scenario, and I am sure some people switched to take advantage of some Plenti rewards. Keep in mind, these people will switch brands based on the deal, which makes you wonder if any switchers “stuck” to the new Plenti brand or just switched again when a better deal came along.